New Stereo Total album will be released on Tapete! C'est formidable - the new Stereo Total album "Ah! Quel Cinéma!" will be released on July 12 on Tapete Records! Available on CD, LP & ltd 2-LP version (300 copies on blue vinyl, w/ six bonus tracks, gatefold sleeve). You can preorder the album here. And make sure to check out the album trailer on the right-hand side! 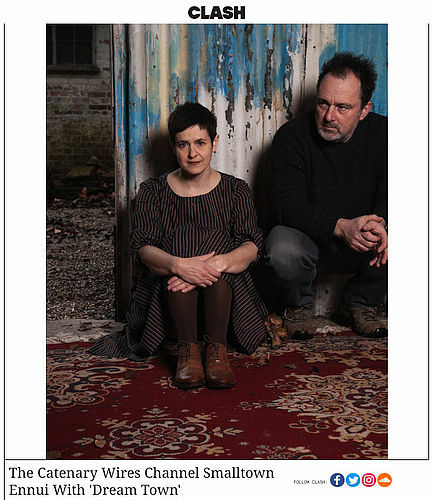 Very happy to announce that the new The Catenary Wires album 'Til The Morning' will be released on Tapete Records in June! Check out the first single 'Dream Town' on Clash Magazine's webpage where the video is being premiered. The single is available on all digital platforms now, too. The album will be ready for preorder in our online shop very soon. Andreas Dorau: Neue Single & Video „Nein!" Andreas Dorau sinniert über das Wort „Nein“. Da muss schon was Bittersüßes her, was Besonderes, und deshalb, meine Damen und Herren, hier ist die erste Ballade, welche Andreas Dorau je als Single veröffentlicht hat! Dazu das strenge, aber auch versöhnlich traurige Video von Anne Schulte und Brigitta Jahn. „Nein“ ist die erste Auskopplung aus Andreas Doraus neuem Album „Das Wesentliche“, auf welchem er sich auf das Wesentliche konzentriert: keine Strophen, sondern fast nur Refrains. Sensationelle Idee! Das Album erscheint am 7.6. bei Tapete Records. Elva released new single "Ghost Writer"! The new single from the upcoming Elva album "Winter Sun" is called "Ghost Writer" and is out now! Full song was premiered via FLOOD Magazine and is available on our Bandcamp account where you can also preorder the album. CD and LP versions of "Winter Sun" which will be released on April 19th are available for preorder in our online shop. PeterLicht ist JETZT mit seinem neuen Album "Wenn wir alle anders sind" auf Tour – nicht verpassen! Hier seht ihr das Video zur aktuellen Single "Umentscheidungslied", bald gibt's was brandneues Visuelles, seid gespannt. Bill Pritchard: new album out now! Today we're celebrating the release of Bill Pritchard's latest album "Midland Lullabies" – the press also loves it! You can order the album right here and find out more if you click right here. Robert Forster: new album out now! Robert Forster's new solo album 'Inferno' is finally out! It has just been made 'album of the month' by Mojo magazine which made us flip. 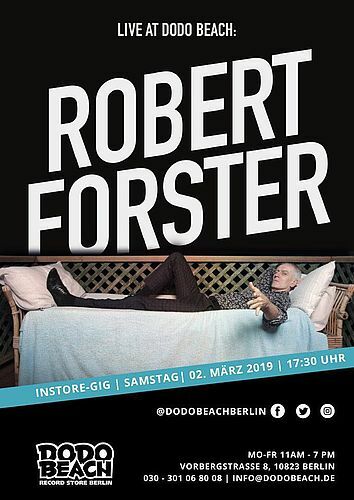 Robert will be on tour in Europe in spring, but as he's in Europe right now, too, to promote his new record, he thought: why not do a little exclusive instore gig in Berlin, where 'Inferno' was made in the summer of 2018. So he will play at Dodo Beach record store in Schöneberg on March 2 at 17:30. Be there! You can find out more about the gig here. And if you'd like to puchase 'Inferno' as an LP, CD or digitally, just head over here. Elva publish video for new single "Athens"! The norwegian indie pop band Elva released their first digital single "Athens". It's the first song from the band's debut album "Winter Sun", that will be out on Tapete Records on April 19th! The "Athens" video was shot by greek filmmakers Ilektra Poirazoglou and Iason Arvanitakis and premiered via Stereogum: "The track takes a much more rustically sensible approach, grounded in heavenly acoustic plucks and light percussion. While still proving a complete mastery of melodic tone, there seems to be a newfound lightness in the air." HGich.T kündigen neues Album "Jeder ist eine Schmetterlingin" an! Zehn Jahre nach den millionenfach geklickten Skandalvideos „Hauptschuhle“ und „Tutenchamun“ veröffentlichen HGich.T ihr fünftes Album „Jeder ist eine Schmetterlingin“ bei Tapete Records und kündigen die größte Tour ihrer Karriere an. Stichwort: „Hilf mir Shiva, hilf mir Goa, ja?“ – „Ja.“ Als kleinen Vorgeschmack auf das Album hat die Band die neue Single "Uboot" mitsamt Video veröffentlicht. Wir singen "0 1 0 0 1". Hier kommt der neueste Streich aus dem Hause OVE – die zweite Single „Fahrrad in der Nacht“ mit dazugehörigem, etwas gemeinem und doch umso unterhaltsamerem Video!